Diminished 7th chords play a special role in music. But their function is quite different from more conventional chords (e.g. major and minor) and can be neglected in our songwriting as a result. Let's begin by looking at the ingredients that make up a diminished 7th chord. From the root (1), we have the intervals of a minor 3rd (♭3) and diminished 5th (♭5), together known as a diminished triad. We then add a diminished 7th interval (♭♭7) making up this four-tone seventh chord. This crucial diminished 7th interval is confusingly labelled as a double flat 7, which is enharmonic to (the same sound as) a major 6th. Don't be put off learning about these chords due to theoretical anomalies like "double flat". It's the sound and function of these chords that truly matters, and that's what we're going to explore! ...or with a small circle and 7 - °7 - next to the root letter (e.g. C°7). Before we look at the ways we can use diminished 7th chords in progressions, it's useful to understand their symmetry. This consecutive sequence of minor 3rds, from root to octave, creates what is known as symmetry. So keep in mind that, in all the examples we'll be looking at, you can position the diminished 7th shape in several positions based on its minor 3rd symmetry, to create different voicings of the same chord. Let's now look at how diminished 7th chords can function in our progressions. Let's say we were in the key of C major. So C major is our 1 or tonic chord. If we wanted to move to the 2 (ii) chord, Dm in this key, we might place a diminished 7th chord between these two chords, as a passing chord. Another example in E major. Note that when I use a " it simply refers to an inversion of the dim7 named just before in the sequence. For example, the inversion of F°7 played below could be seen as A♭°7, or just F°7 again. It's all the same notes! The diminished 7th chord also commonly occurs between the 4 and 5 chords in major keys. For example, in the key of G major, C major would be our 4 chord and D major our 5 chord. So whenever you find yourself on the 4 chord of a major key, a diminished 7th chord can be seen as one fret up from that. What we've done so far is fill whole step gaps in the natural major key with a diminised 7th chord, between the 1 and 2 and 4 and 5. And using the chord's symmetry, the dimished 7th between 4 and 5 also fills the whole step between 2 and 3. 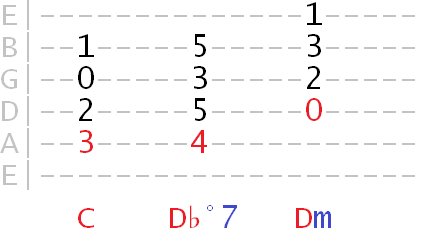 The diminished 7th between 1 and 2 also fills the whole step between 6 and 7. So one effective way to use diminished 7th chords is to place them between the natural chords of the key. Another common example of this you'll hear, particularly in jazz styles such as bossa nova, is the diminished 7th between the ii and iii. Here we're in the key of F major, with Gm as the ii chord. The diminished 7th chord can also work as a dominant substitute in both major and minor keys. Therefore in C major, Bdim7 would be our dominant substitute. And using the symmetry from earlier, we can again take this form up the neck to relative positions. For example, on the 4 position of F and beyond. We can hear a tension-resolution effect with the diminished 7th in these positions similar to how the dominant functions. The diminished 7th chord is used in a similar way in minor keys, typically to create more tension over the 5 chord. In the key of A minor for example, E7 would be our dominant chord, based on the harmonic minor scale. 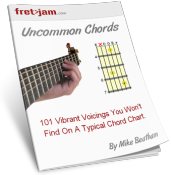 Keep experimenting with diminished 7th chords in your own music. You never know what you might discover until you try!